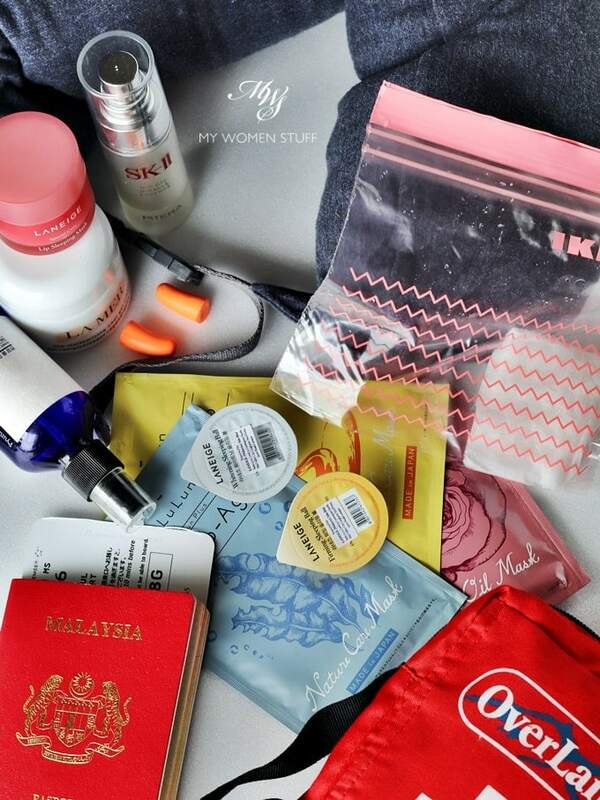 Home » Interesting Discussions » I never leave home without these 9 Travel Essentials! Maybe you shouldn’t too! I always travel with ear plugs in-flight, to block out noises and crying babies if I plan to have some shut-eye. Otherwise, I’m usually watching the in-flight entertainment so I’d have the headphones on. Ear plugs are also essential for me at my destination, to block out noises when I sleep. It helps me sleep better, and helps me adapt to a new environment better. No unfamiliar noises to keep me awake. For me, this is important, for I have trouble sleeping, and I don’t want to over-tire myself out by having a poor night’s sleep to boot. I am usually more diligent with my masking when I travel. This is to make up for a more pared down skincare routine, and to ensure my skin is well hydrated. I usually pack a few sheet masks for use at my destination. But in-flight, I usually go with a sleeping mask. Incidentally, Laneige sells single-use travel pods of their sleeping masks or wash-off masks. I find these very useful because you don’t have to carry your whole tub with you. You can buy them from the Laneige store (Pavilion KL) and each pod can last up to 3-4 uses. So, you can share it with your travel partner, as I did, or you can scoop out half, seal it back, and use the remainder on your return flight. Ever tried washing your face in the tiny airplane bathroom? Don’t try it. Seriously. I used to be very diligent about washing my face. I always do a cleanse about an hour into the flight, once in-flight service begins, and time was, I’d actually wash my face in the bathroom. It is messy, and I spend half as much time cleaning up after me. This trip, I did something different. I moistened some cotton pads with Bioderma micellar water, and sealed them into a zip-lock bag. In-flight, I could use it to cleanse my skin in my seat itself, which was useful. You do have to get the cotton pads very wet, but it is a good way to not only cleanse your skin, but to refresh yourself part-way through the flight, or even to use it to remove your sleeping mask. After cleansing, I refresh my skin with a facial mist. Not only does it refresh your skin, it will help add moisture and hydration as well. I sandwich all layers of my skincare with a mist, and it helps my skin remain more hydrated. This is helpful both in cool and warm climates, as it stops your skin from becoming dehydrated. With a facial mist in hand, I actually pare my skincare routine down to almost the bare minimum. My focus when I travel, is always on hydration. All other treatments take a backseat. To my surprise, this time around, my skin not only remained soft, supple and hydrated, it did not break out at all, and even better, did not break out when I returned home either. Whenever I travel, I usually pack a good, heavy moisturiser. In flight, where the air is dry, a heavier moisturiser helps lock in the moisture and keeps my skin soft and moisturised. At my destination, this same moisturiser usually serves the same function, as the air might be dry or the rooms might be heated. Either way, I find my skin tends to feel drier when I travel, so a good moisturiser and a facial oil helps me balance out my skincare accordingly. I don’t use lip balms when I’m back home in Malaysia, but when I travel, there are 2 lip treatments that go with me everywhere – the Laneige Lip Sleeping Mask, and the La Mer Lip Balm. I always apply a thick layer of the Laneige Lip Sleeping Mask before bed, and it helps me wake up to chap-free lips. I also apply a layer on my lips in the morning, before I go out. This helps my lips stay smooth, comfortable and chap-free in cold or windy conditions. I use the La Mer Lip Balm while I’m out and about because it is more portable. In flight, slap on a thick layer of the Laneige Lip Sleeping Mask. It really does protect your lips from the dry cabin air. And for goodness sake, DO NOT LICK YOUR LIPS! Saliva dries out your lips further. A while ago, I shared my in-flight beauty essentials, and I’ve realised that since then, I carry a different configuration. A hand cream is less essential for me now, as I find that the scent bothers me. I try to fly with products that don’t have too strong a scent, as it can be oppressive in an enclosed space. This is why perfume is a no-no for me when I fly! I’m not sure what to call this, but this isn’t your normal U-shaped neck pillow. I bought mine from Muji – the Muji Neck Cushion. It goes around your neck, and clips in front of you to stay in place. I find the beanbag type filling of the cushion supports my neck better, and it is very comfortable without being too warm. But what I like better, is the fact that you can unclip it, so it becomes a long pillow. You can then use it to support your back if you’re sitting on a long journey, or to support your legs when you sleep. After a long day of walking, raising your legs help them feel less tired the next day. If the pillow at your destination isn’t to your satisfaction, you can use this cushion as your pillow. Or you can just hug it to sleep 😀 Either way, I find this pillow to be the best neck cushion I’ve ever travelled with! I’m sure you can find similar ones out there. Get the ones that buckle because you can usually do more with them, as opposed to the ones that come in and stay in a U-shape. You might think this an odd travel essential, but trust me, you should put one together for your next trip. You never know when misfortune might strike, or when you may have a headache or the sniffles, and need some relief. Having medication that you are familiar with is useful, and convenient, especially when in a foreign land where you may not speak the language. I top them up before I travel, and pare off any expired medication. I stick to medication I am familiar with, and it goes a long way towards helping you have a more comfortable trip when you have medication on hand, instead of having to navigate a foreign pharmacy, that may not have medication you usually take. Always, ALWAYS have a scarf or shawl on you. It will help you through cold airports, and serve to protect you from the cold and wind when you’re out. Aside from keeping you warm, it will also serve as a cover-up if you are visiting places of worship. I tied my scarf around my waist as a sarong, when I visited the Vatican, and the Swiss Guards deemed my (not very short) skirt too short 😛 It can also serve to cover bare shoulders or a bare head where necessary. In warm countries, where air-conditioning indoors is usually on full blast, it helps you stay comfortable so you don’t catch a chill from the sudden changes in temperature. There are lots of uses for a scarf, so always have one on you. You never know when it will come in useful! Do you have travel essentials that always go with you on every trip? Do you carry a first aid kit? I cannot remember when I started packing a first aid kit, but it’s been one of my most useful items to date. I bought my pouch from a travel store many years ago, and you can really use any pouch you have. Better to be safe than sorry, I always say! Sanitizers, wet wipes, cuticle oil, eyebrow tweezers and some tissues! Cannot travel or leave the house without them. I definitely carry a first aid kit whenever I travel and they are stock up wit the same essentials as your first aid kit minus the soluble Vitamin C. LOL. Since I started my essential oil journey last year, I also carry some of them especially the oils that help with flu and headaches. Peppermint for headaches and nausea works like a charm for me:-). With a toddler in tow, I naturally need to pack some extra essential items so wet wipes and my boy’s water bottle are items which I cannot live without. I did bring some lavender oil to help me relax, but as it turned out, I was so tired every day, sleep wasn’t an issue LOL! But I do try not to carry on board flight things that smell too strongly, because I don’t want to pollute the air. Not everyone appreciates a smell that I might find relaxing, so in flight, I don’t do smells. Oh and comfortable clothes is a MUST! I see lots of fashionable people on board, and to be honest, I always hope they’re comfortable haha! Because I know that if I had to travel in anything that is fitting, it’d be far too uncomfortable. Our bodies will expand in flight, and I can’t imagine having to suffer with fitted clothing in that time! I’ve never been on a cruise! It sounds like fun, and I hope you have a good time. The good thing about cruises, you don’t have to move around too much, so I imagine your luggage shouldn’t have too much restrictions too! 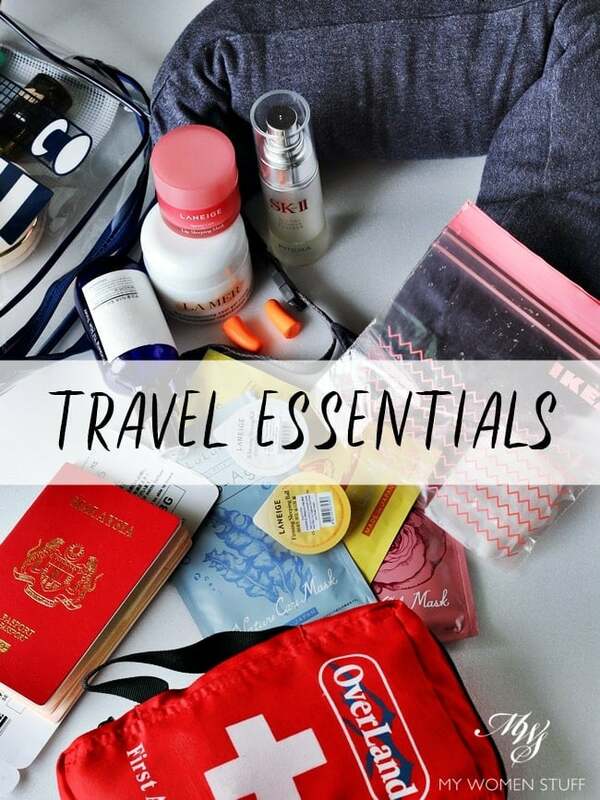 Oooh how I love a good travel essentials post! That MUJI travel pillow is the best thing I’ve purchased for my travels. I was devastated when I left mine at a hotel in Frankfurt last year because that pillow went to so many places with me. I don’t use it when clipped; much prefer it long, like a baby’s bolster. They’re comforting when placed over my eyes or chest when I’m away from home. As for first aid kit, I never travel without my trusty medical bag. Even if it’s an overnight trip, I’d bring it along with me. It has all the important medical stuff I would need just in case: paracetamol, ibuprofen, antacids, stomachache pills, sterile wipes (so important! ), minyak angin, antiseptic cream, cold and flu meds, lozenges, antihistamines, etc. Before each trip, I check the bag to make sure nothing in there is expired. It sounds over the top I know but it’s so incredibly useful when you need something, especially if I’m in a foreign country and I don’t speak nor read the language. Btw, that tip about pre soaking cotton pads with micellar water. Genius! Try it next time! I swear, it’s the best thing ever!! But make sure you soak a few. I found they tended to stick together, so you may end up using more than you realise, and less than you have! Yay for another Muji travel pillow fan! My Mom bought it first, and was so taken by it, I had to see why she liked it so much! It’s useful that you have a Dr. in the house! haha! But I am with you. In a foreign land, you don’t want to be trying to find medication for an ailment, that you know only needs Panadol. That’s so synonymous with paracetamol for us here, that I sometimes have trouble remembering that it’s not the medical name! Pre moistened cotton pads with micellar water is game changing for me. Save more space in luggage and also ok to put in the luggage. I did have a small bottle of micellar water in my check in luggage, because I didn’t think I’d be able to survive on just moistened cotton pads alone the whole trip haha! But I will be sure to pack these when I travel for short trips, because it’s as you said, a game changer! Pre soaked cleansing pads is genius! Gonna do that from now on. Thanks for sharing! The rest I pretty much do already. I use Origins Drink Up Intensive Overnight mask on my face and lips cos I malas to bring an additional product for lips haha! My sis thinks I’m such a geek for packing in a first aid kit but it’s essential to me. Mine also contains anti-histamines and antacids cos I’m prone to tummy issues if my mealtimes are irregular. I reach out lesser on my sleeping mask nowadays as I’m sure some will transferred to my bedsheet or pillow case which I’m not ready to change yet *lazy*…I have to reminds myself to bring along to my next flight now! Thanks! If you roll around or rub your face into your pillow, yes there is every chance a sleeping mask will transfer (but so will your skincare!) haha 😀 But yes, pack it for your next plane ride – your skin will love you for it! that moistened cotton pad is a nifty tip! i also have the muji neck pillow, but find it a bit too soft n doesn’t hug the neck as closely, but yes to a being a small bolster or a small pillow when clip up! You are right actually Plue, the pillow isn’t as snug around the neck as the U shape ones. But I don’t mind it as much, because I just want somewhere to lean my head in case I fall asleep, or to watch movies haha! At least I won’t have a crick in my neck! What do I always carry? Face wipes – my favourite Wotnot wipes which are super gentle, quite wet but hydrating. Though I would so use your soaked cotton pad trick if I was out of these! Medication plus a little first aid kit, including dissolvable tablets with electrolytes in case you become dehydrated! That’s a good list Sylvis! You know the problem? By the time I put all of that into my in-flight bag, it’s full! Sometimes, I wonder why I do this to myself haha! As for water, I know how you feel. It’s so dehydrating in flight isn’t it? What I do is to bring on board an empty water bottle. I then get it refilled in flight, and I always, ALWAYS get an aisle seat! The water has to come out some time! haha! Oh yes… I always struggle with the amount of hand luggage Ive got. WHY have I never thought about taking an empty bottle on board?!?! I remember when I was flying to Hong Kong/Macau from Sydney, the Qantas plane I was on had like a water station where you could fill up a cup (or bottle!) without having to ask the flight attendants to serve you. Genius! Oh yes I’ve heard of those self-refilling water stations. But somehow none of the flights I’ve been on have them LOL! But on the bright side, I’ll usually get the water from a bottle, and I have read some really unsavoury things about not drinking water on a plane (that doesn’t come in a bottle) Yikes! LOL! Eye drops and eye shade are important to me on night flights. And I always have the Japanese paper eye masks that warm up on contact with my eyes underneath my eye shade. Helps me sleep really well. One other essential item is feminine wipes, esp. for long haul flights. Good call Tessa! That would go a long way towards making for a more comfortable flight! Ooh yes those warm up masks. I’ve never tried them, but I hear they are very soothing! I saw a lot of people in flight with eye masks on too. But it’s something I’m not used to using. I might try it next time though. It’ll stop me from watching too much inflight entertainment! LOL!